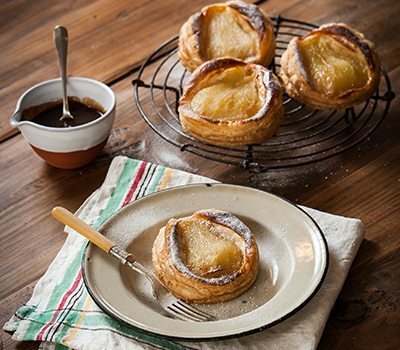 The great thing about puff pastry is the beauty in the simplicity of dishes you can make with it. When it comes to simplicity this pear tart is no exception. Autumn / winter fruit desserts tend to be dictated by a choice of pear or apple; however there is also the noble quince to consider, just make sure you cook them, they are tart and unappealing when raw. 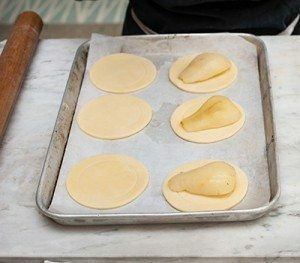 I have included a recipe at the bottom of this page for poaching quinces if the idea takes anyone’s fancy. 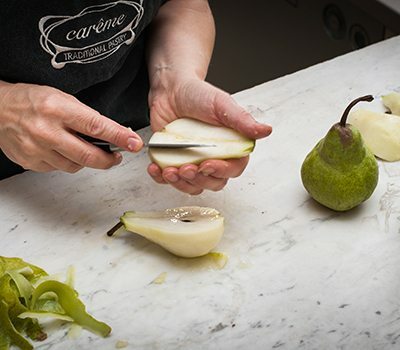 Back to the pears, we chose to poach them, nothing complicated, just add to a simple sugar syrup flavoured with vanilla and spice; there is something so very satisfying about a poached pear, maybe it is a childhood memory of poached fruits and ice-cream. If you have an abundance of pears poach a few extra and store in the refrigerator in their poaching liquid or preserve in jars. We used the Packham variety, they are easily the most common variety available plus their shape is perfect for this dish, buy them firm when poaching. We couldn’t go past a warm chocolate custard to serve with this and for all the Thermomix lovers out there we have included a Thermomix version of the custard. This will make your house smell divine! Peel, core and quarter the quinces. Tie the peelings and cores together in a piece of muslin. 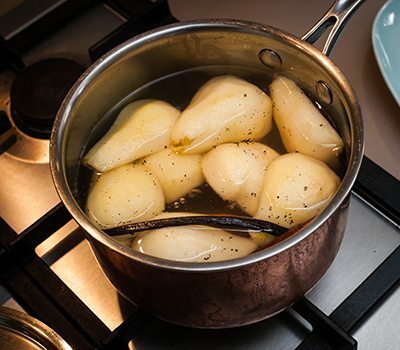 Place the remaining ingredients together in a large ovenproof pot over a low heat, stirring until the sugar dissolves. Increase heat to medium-high, bring to the boil and cook for 2 minutes. Add the prepared quinces and muslin bundle to the pot, making sure the quince pieces are submerged. Cover securely and place in preheated oven for 5 hours or until quinces are a deep ruby colour. Remove from oven and allow to cool.